Omega challenged itself by creating the METAS certification introduced last year. This new protocol of tests applied to every watch gathers 8 criteria including resisting to an antimagnetic field of 15'000 gauss, the strongest on the market. Because of it, Omega works hard to replace a maximum of parts reacting to magnetic fields. This process implies revising all the (mechanical) movements to make them antimagnetic. And the catalog counts dozens of them. It is then a huge effort that the engineers have to make to achieve the goal of an entire METAS certified production in 2020. This year, 6 new calibers were introduced, most of them being modified versions of existing ones. Among them is the new caliber 8800 that will replace the first co-axial caliber ever produced industrially, the 2500. The new 8922 is also interesting as it is one the very rare annual calendar displaying the month with a hand. It was integrated in the Globemaster with its « pie pan » dial which facets indicate the month. 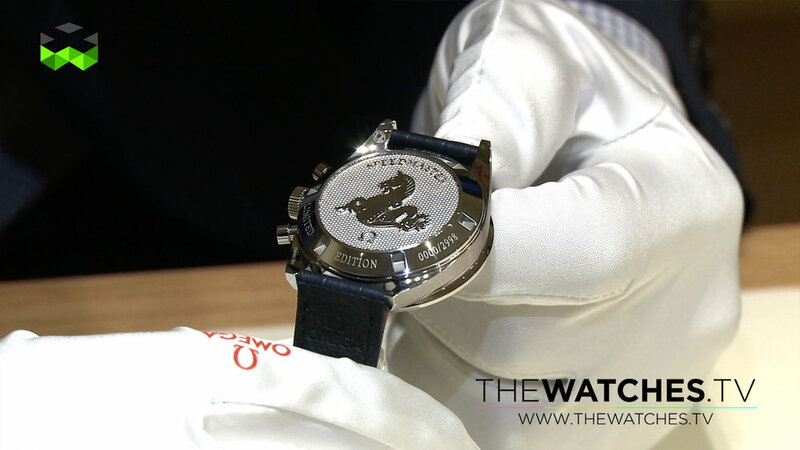 The platinum version is for instance available in a limited edition of 52 pieces in platinum for 46'000.- Swiss francs. Of course, Omega’s legend is the Speedmaster, aka the « Moonwatch », that comes every year in a large variation of new versions. This year, many colors and combination of materials were presented. As for instance this grey ceramic with yellow and green ceramic bezel that caught the eye of many aficionados. Or this entirely blue version that also was very appreciated. What matters here is the fact that Omega masters always better the manufacturing at large scale of the materials it introduced these last years such as the liquid metal, the Sedna gold or the ceramic. One splendid « Grey side of the moon » version with a dial made out of meteorite deserves a special applause. But take note that this model won’t be able to last after 2020 because of the major influence magnetic fields have on the dial. To finish with the Speedmaster new products, a re-release of a « premoon » Speedmaster from 1959 was presented with the manual winding caliber 1861 and the same design as the original. Called CK2998 as the name of the steel used to manufacture its case, it is available in a limited edition of 2998 units for 5'600.- Swiss francs. Omega also totally revamped its diving Planet Ocean collection introducing many aesthetical new features in terms of colors, design and materials. The Biel-based manufacture succeeded in particular in producing titanium dials, a highly difficult operation as the metal is very sensitive. Omega introduced a new antibacterial rubber strap that took 2 years of research and development with 2 external suppliers. Contrary to appearances, the manufacturing of the strap is quite complex.